Meatless Mondays have soared in popularity with more and more people dabbling in vegetarian cooking on a weekly basis. All you have to do is search the #meatlessmonday hashtag on Twitter or Instagram, and you’ll be overwhelmed with inspiration. While I’m not 100% vegetarian, my family and I do enjoy a flexitarian style diet, and on the nights where we aren’t eating animal products, I don’t miss them one bit. Vegetarian (and vegan) cooking doesn’t have to be bland or boring, and most of the time, you won’t even miss the meat! You also don’t have to load up with a heavy grain-based meal in order to feel satisfied. I have a real obsession with using Asian and Indian spices in my meals – especially my meatless ones. My taste buds get excited just thinking about it! Earlier this summer I had lunch with a dear friend and I had this amazing roasted cauliflower and quinoa concoction that had a curry flavour to it. It was so. Damn. Good. 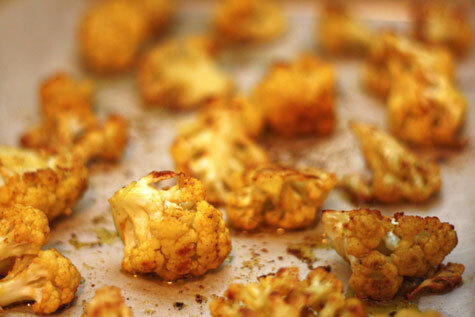 If you haven’t roasted your cauliflower yet, you are missing out on something amazing. 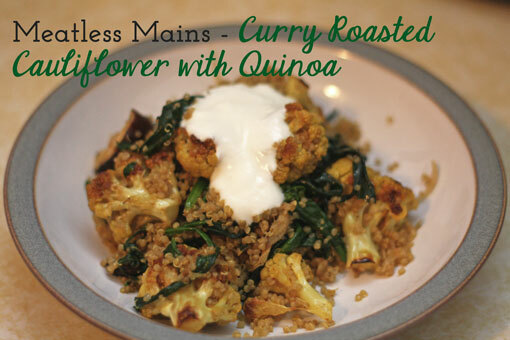 Even someone who claims not to like cauliflower would be hard pressed not to enjoy it roasted. In this recipe, the cauliflower is spiced with curry powder and coriander before it’s roasted, and those aromatic spices come to life in the heat of the oven. You probably won’t believe me, but from start to finish this is a 30 minute recipe. If you have leftover, cooked quinoa, then you’re that much further ahead. While the onions are caramelizing, the cauliflower is roasting and the quinoa is cooking. Spinach is wilted right at the end and then everything is thrown together in the one pot and mixed up. Boom. Done. Not only is this meal tasty and fast, it’s also really really good for you. Cauliflower is a member of the cabbage family and therefore contains compounds that may help prevent cancer. It’s an excellent source of vitamin C and K, as well as fibre, potassium, and B vitamins. Spinach is one of the most alkaline-producing foods and is helpful when trying to regulate the body’s pH. It’s an excellent source of vitamin K, carotenes, folic acid, and vitamin C. It’s also high in magnesium, iron, and vitamin B2. Spinach also happens to be one of the richest sources of lutein which promotes eye health. Its high levels of chlorophyll and carotenes make it a strong protector against cancer. Onions contain various sulfur compounds that are helpful in lowering blood pressure, preventing clot formation, and lowering blood-lipid levels. 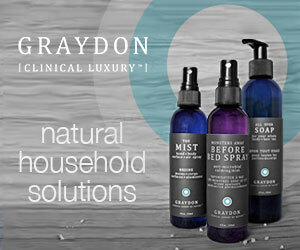 They are also helpful in lowering blood sugar levels and. Test tube studies have shown onions to destroy tumor cells and stop tumor growth. For those who suffer from asthma, onions have the ability to help relax the bronchial muscles and prevent spasming. Quinoa is considered a grain but is, in fact, a seed related to the beet, chard, and spinach plants. The seeds cook quickly, have a delicate, nutty flavour and are considered one of the least allergenic of all the grains. Quinoa is an excellent gluten-free grain choice, and is very rich in amino acids, high in magnesium, and fibre. Because of its protein content, and the fact that it contains all the essential amino acids, quinoa is an excellent protein source for vegans and vegetarians. Step 1 – Preheat oven to 400 degrees. Line backing sheet with parchment paper. Heat coconut oil in large sauté pan over med heat. 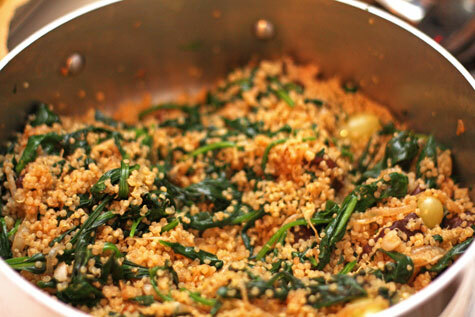 Step 2 – If your quinoa isn’t already cooked, put it on to cook now. 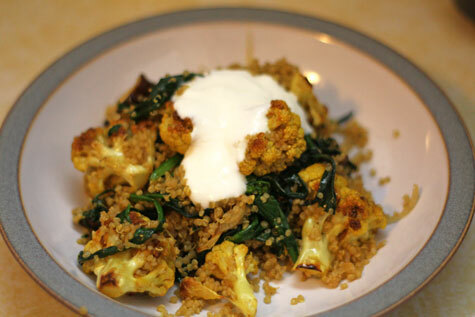 Step 3 – Toss cauliflower with olive oil, coriander (if using) and curry powder. Spread out evenly on the baking sheet, leaving space between pieces. It’s important not to overcrowd them, otherwise they will steam not roast. Use a second baking sheet if necessary. Put them in the oven. Roast for around 20 mins, turning halfway through, or until golden brown on edges but not burnt. 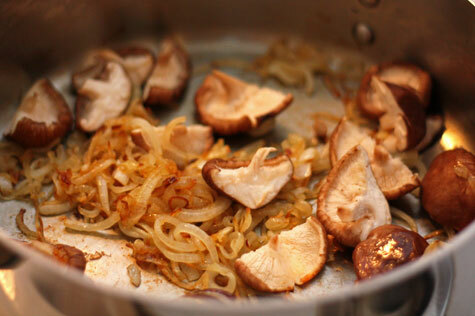 Step 4 – Add onions to heated oil in pan. Turn down heat slightly and begin to cook onions, stirring occasionally, until caramelized. This will take anywhere from 15-30 mins depending on your stove. Do not rush the cooking, and do not allow onions to burn. Step 5 – Just as onions are golden brown and caramelized, add minced garlic and grapes to the pan. Turn up the heat slightly and cook for a few minutes, stirring. Add spinach to the pan and cook until wilted. Add cooked quinoa and roasted cauliflower to the pot, and stir to combine. Finish by seasoning with garam masala and stir well. I love serving this topped with a small dollop of plain yoghurt or kefir. Yum! Leftovers are delicious for lunch the next day.